Here's the apartment that John and Yoko first moved into when they first moved here in 1971, 105 Bank Street in Greenwich Village. This is when he was at the most political phase of his life and his neighbors on the block included Abbie Hoffman and Jerry Rubin. 321 W. 44th Street is where John Lennon recorded many tunes when it was the Record Plant. Now it's the office for the New York Observer. They wrote about me back in my pre-blogging days. Smith's Bar is down at the end of the block and I've read that John Lennon would come in here for a burger and a beer during a break in recording. I only eat a burger on Saturdays, but I could stand to take a beer break, so let's go inside. Smith's used to be a pretty rough dive bar, but it's been cleaned up just like the rest of Times Square. John Lennon, this Bud's for you! And thanks to the New York Observer for the free paper from the lobby. I'm heading to the Upper West Side and believe it or not, this guy is singing a John Lennon song in the subway. 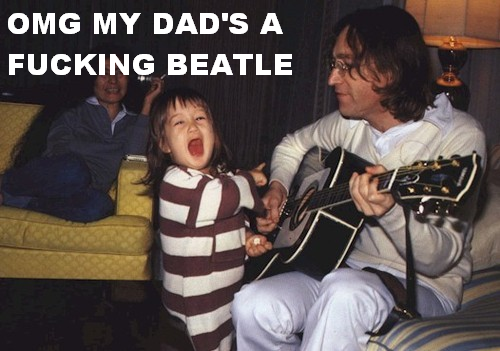 Well, actually it's a Beatles song, but one that Lennon wrote, "In My Life." This deserves a tip! And when I go to throw a couple bucks in his case, look who's staring back at me! Crazy! At first glance, this looks like a normal drug store, why would this be on a John Lennon Walking Tour, you wonder? Because this photo is in the corner of the front window. Along with this message and tribute to John Lennon. Inside the pharmacy, there's a collage of some of the famous faces who have shopped and stopped in here. In the center of it all, is a classic photo of John Lennon shot by photographer Bob Gruen. This is the owner of the West Side Pharmacy, Dr. Said Saber. John Lennon lived a few blocks away at the Dakota and stopped in here frequently and the two of them became good friends. You can see Said talk about this below, in the "Further Reading and Viewing" section. Note the photo to the right of Said, it's him with another famous singer, James Taylor. Usually there's some yahoo massacring a Beatles and/or John Lennon tune in here, but there's not that many people here today, so thankfully it's yahoo free. Yahoo! Here's the centerpiece in Strawberry Fields, a mosaic "Imagine" art piece. This guy is placing some flowers on it. Adding the apple was a nice touch, especially if a homeless person wanders by. Free lunch! As you walk out of Strawberry Fields, you can see the massive Dakota building, where John Lennon lived for his last seven years in New York City. This is also the building they shot the movie, Rosemary's Baby in. And here's the spot where John Lennon was murdered by Mark David Chapman. Okay, this is getting a little depressing, time for a drink! Malchy's is a great neighborhood bar that's been on the block forever. I came here on my 365 Bars tour and I think it's time to check it out again! It's still the same. This is one of those joints that time never seems to touch! I was hoping to see bartender/author, Dorian Yeager, who we met on the 365 bar crawl, but it turns out she only works weekends. I'll have to revisit this place for a Saturday Night Cheeseburger soon! Working the bar today was Anna and Billy, two fine and friendly people! I had heard that John Lennon used to stop in here occasionally and Billy said in addition to him, Ray Davies of the Kinks used to be a regular when he lived on this block and whenever he plays in town, he stops here afterwards. I'll have to come here next time he's in town! Just like Rudy's, vintage lamps swing over and illuminate the bar in here. It's the Fabulous Four on the wall! Okay, that seems to be the appropriate place to end this tour and settle in at the bar for a few beers. And as I leave, night has fallen on the Upper West Side. I love it when that happens! Further Reading and Viewing: CBS New York, New York Magazine and YouTube. And we found that he was real. Thanks to Al Rizo, for suggesting this idea, it was a ton of fun! 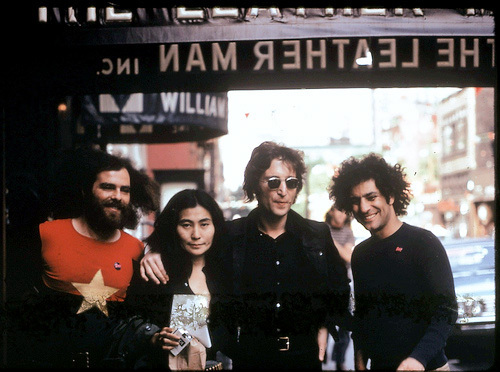 Here’s a photo of David Peel, the longtime Lower East Side resident immortalized in John Lennon’s song, “New York City," flanked by Shawn Chittle and Yours Fooly from last summer. I was going out to Coney Island with my friend Shawn and Shawn saw him in the subway station at Coney Island. We met and snapped some photos of him. and with him. A very cool moment in time!